Things I wish I’d learned as a younger man. Rules that rhyme are full of it. It’s simple if you think about it. The truth rarely rhymes. To make a rule that rhymes, just start with the truth (or anything else that happens to be handy) and swap the last word for something else that rhymes better. And what you have is no longer the truth, it’s . . . well, something else than the truth that rhymes better. Rules that add up to 100% are full of it. The archetypal example is the 80-20 rule. Most commonly it’s stated as something like 80% of your results comes from 20% of your effort. It’s true that all your effort must add up to 100% of your effort. It’s also true that all your results must add up to 100% of your results. But there’s no earthly reason that part of your effort added to part of your results would add up to 100%. In fact, there’s less than a 1% chance of that at any given point in a project. The 80-20 rule is numerically unsound for sure. It’s most interesting for its potential to use a factual falsehood to convey a larger truth — or at least a half-truth. Just don’t take it at face value. It’s never numerically correct and much of the time it suggests the opposite of the conceptual truth. Caffeine is not our friend. My brain is a flex-fuel engine, but it does have its needs. Specifically 96-octane Beethoven, Bach, Chopin, or Field. NASA – Noever, R., J. Cronise, and R. A. Relwani. 1995. 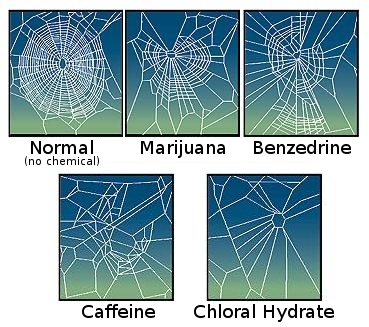 Using spider-web patterns to determine toxicity. NASA Tech Briefs 19(4):82. Published in New Scientist magazine, 29 April 1995. Instead I’m told my brain is a neural web. I don’t really want to think about the implications of that, because I lived fifteen years of my life without caffeine — but not the last fifteen. History often matters. The news often doesn’t. Turn off CNN and even MSNBC and Wi-Fi and replace them with an emergency-alert weather radio. Then read a book or something that will still matter tomorrow. Multitasking isn’t a virtue, it’s a mass delusion. Nobody does it well. Some people are only better at deluding themselves and possibly others that they do. T’Aleesha’s teachers can’t spell or write, either. It’s not just the kids anymore. It’s their teachers, too. And their parents. And I’ve got the homework corrections to prove it — left by T’Aleesha in the crook of my Bradford Pear tree. She’s actually a sweet kid, as far as I can tell. She probably deserves better than the teachers she seems to have. Emerson was right about hitching our wagon to a star. I just wish he had been a little more forthcoming with the logistical details.